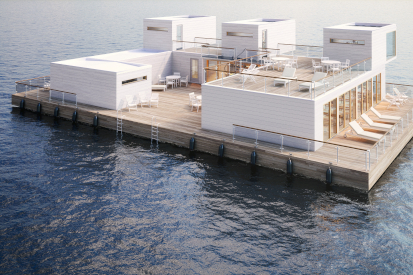 Bluet is a Finnish company, specialising in floating construction solutions. 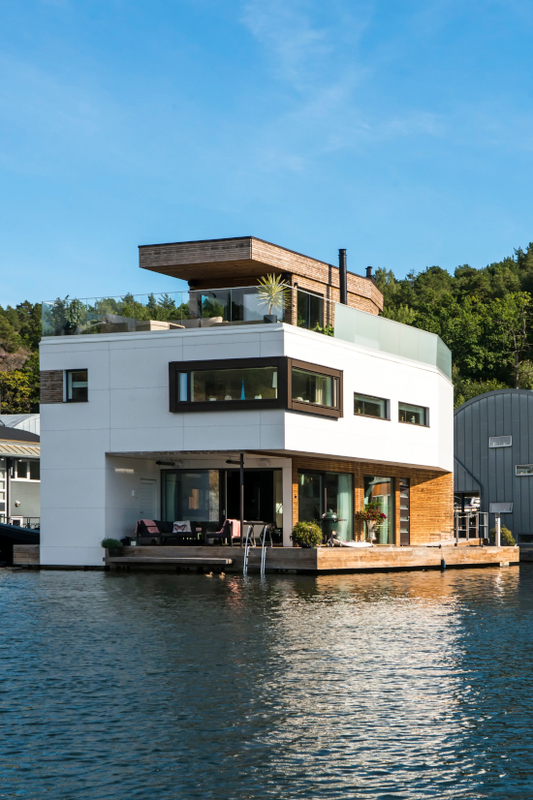 From swimming pools to shopping centres and offices, building on water is becoming an increasingly attractive option as it is easily modifiable and environmentally sustainable – and Bluet believes the future is floating. Floating construction and waterfront development is gaining in popularity, and cities and companies are increasingly looking at waterfront areas, and how they can be developed into multifunctional spaces for people to enjoy. “Land area is a limited entity. As cities and companies are increasingly gravitating towards the waterfront areas favoured by consumers, the land areas that can be developed are decreasing. Our solution is to build on water, therefore increasing the space available, without having to touch the shoreline and beach area, for example,” says Tytti Sirola, Bluet’s managing director. Sirola founded the company in 2016, along with technical director Kimmo Saharinen and Petteri Huomo. Their shared expertise and years of experience in construction, real estate, project management, as well as sales and marketing have allowed Bluet to grow from strength to strength, and thrive into a successful business, recognised all over the world. Having previously worked for Marina Housing with floating solution projects, Bluet continues to co-operate with Marinetek Group, as well as a number of other international suppliers and designers. Referring to themselves as a one-stop-shop, Bluet is able to cater to all clients’ needs. The firm’s multi-skilled team is able to partake in projects of any size and shape, and have as much or as little input in any aspect of the project as the client wishes. “From early vision stages and waterfront development to the final design; we are able to do it all. We work with local constructors, designers and suppliers alike, and are happy to oversee the whole project, or be the tiny piece of the puzzle that has been missing from the clients’ team all along,” Sirola explains. At the core of Bluet’s values are sustainability and improving the usability of waterfront areas. “We want to give inhabitants and visitors new ways of enjoying the water, and frame new ways we see the waterfront. It can be a place for activities, experiences and living: from beach clubs, swimming pools, sports and leisure centres, offices, restaurants, nightclubs, shopping centres, private homes, hotel villas, parks, bike routes and even large housing areas – you name it. With floating technology, the solutions are widely scalable and modifiable,” Sirola says. The company’s main aim is to provide solutions with a long life-cycle, made from good quality, sustainable, non-toxic materials. 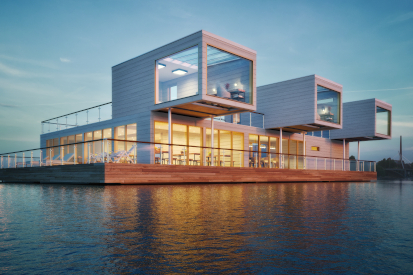 Building on water allows the structures to be easily modified in case operational needs change, require enlargement, or in the event of a structure needing to be moved to another site, further adding to the long-term life-cycle of the structure. Bluet also favours sustainable energy solutions whenever possible. “We have gained recognition around the world because of our working methods, and the fact that we genuinely value good quality construction, and fully tailor our solutions to suit each clients’ needs,” she adds. Bluet’s most notable project to date has been the Allas Sea Pool Helsinki marine spa, the first of its kind in the world, next to the Market Square in Helsinki. 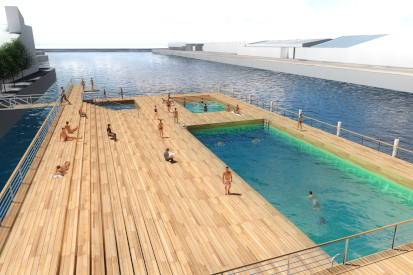 The floating deck has three heated swimming pools, and the surface’s space is over 2,600 square metres, with a capacity for 3,500 visitors per day. “Allas Sea Pool has rekindled the Finnish capital’s historic status as a spa town and opened more of the city’s precious and stunning shoreline to the public. The technically unique complex is designed for year-round use and has attracted interest in the other Nordic countries, and we are currently building Allas Sea Pool Oulu in Finland, which will open at the end of next year. Another example of an ongoing project is a hot thermal bath in Iceland – Vök Baths – opening in summer 2019,” says Sirola. With a number of projects currently underway in Finland, Iceland, Sweden, Norway and Australia, it is clear the Bluet’s constructions have piqued the interest of developers around the globe. “A lot of businesses are still cautious and wary of floating structures, and it is a common misconception that building on water will ruin the beaches and waterfront. This is not the case at all, as we are able to increase the space by building on water, without needing to change the beachfront itself at all. Our structures can be removed, and there will be no evidence there was ever something there. This is not only ecological, but also opens up opportunities for scalability and adaptability. We want to bring the waterfront as close to people as possible, and allow everyone to enjoy the water in new ways,” Sirola concludes.